By Chris Williams: Top Rank promoter Bob Arum says the Vasyl Lomachenko vs. Mikey Garcia unification fight, that he’s been eager to make for ages, has “lost value” following Garcia’s trouncing by IBF welterweight champion Errol Spence Jr. last Saturday night in Arlington, Texas, according to Mike Coppinger. Arum called Mikey a “Mutt” based on the effort he put in against Spence, according to Coppinger. It did look to some boxing fans like Mikey wasn’t willing to go all out the way he needed to for him to have had a better chance of winning. In other words, Mikey wasn’t willing to go out on his shield if need be in order to win the fight. He fought like he was just trying to survive for 12 rounds without getting knocked out. Even though Mikey lost to a bigger fighter in 5’9 1/2″ Spence, he still took a hit in terms of popularity. Being seen losing to Spence has effected how Mikey is perceived by boxing fans. It’s not as bad losing to Spence obviously as it would be to someone from his own division like Lomachenko, but it still wasn’t a good thing that he was so easily beaten. It was such a bad loss by Mikey (39-1, 30 KOs) that it likely will have drained a lot of the interest that there would have been in a Lomachenko vs. Garcia had it taken place before Mikey’s loss to Spence. Still, even with the loss to Spence, Mikey is arguably a far more popular fighter in the eyes of the U.S boxing fans than Lomachenko. Had Spence fought Lomachenko last Saturday night instead of Garcia, it’s unlikely there would have been as much interest in the fight with the casual boxing fans as there was with the Spence-Garcia fight. Mikey’s punch resistance was the only thing that stood out for him. Mikey took some MAJOR shots from Spence, and he was never hurt. 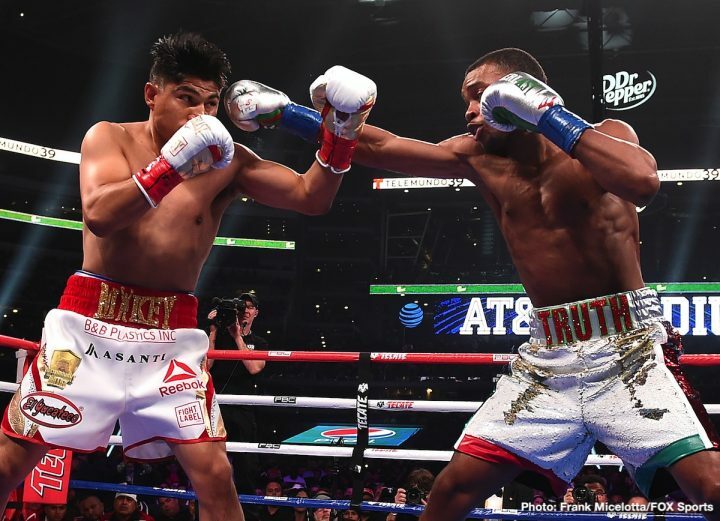 He did look like he was wilting in the ninth round when Spence started putting it on him, but fortunately for him, that was the only round where he was under a constant bombardment. Mikey remains more popular than Lomachenko. It’s probably correct on Arum’s part that the Lomachenko vs. Garcia fight has lost a lot of the value that it would have had if Mikey wasn’t beaten, but it’s still going to be a good fight if it happens. It would be better though if Mikey got a couple of good wins under his belt before he takes the fight with Lomachenko. Right now would not be a good time for Mikey and Lomachenko to fight each other. Garcia, 31, showed no variety with his punches against Spence, throwing the same old left-right combinations the entire fight. Garcia’s punch output was pathetic, as he was BADLY outworked by Spence, who threw 1,083 punches in the fight. Garcia landed only 75 shots in the entire fight. The low connect rate for Garcia wasn’t because he was missing all night. It was due to him not letting his hands go in the way he needed to for him to have a shot at winning. Arum didn’t say that he’s not interested in putting the Lomachenko vs. Garcia fight together. Obviously, that’s still a viable option for Lomachenko, as long as Mikey holds the WBC lightweight belt. Lomachenko wants to capture Garcia’s belt so that he can unify the division. Lomachenko will likely be fighting IBF lightweight champion Richard Commey this summer after he defends his titles against Anthony Crolla. If Lomachenko beats Commey, he’ll hold three of the four titles [IBF, WBA and WBO] at lightweight. The only belt that Lomachenko would need to win to become the unified lightweight champion would be the World Boxing Council strap held by Mikey, who is expected to move back down to lightweight or light welterweight. Mikey’s trainer Robert Garcia wants him to fight at 140 for some reason. Lomachenko (12-1, 9 KOs) will be fighting next month in defending his WBA/WBO lightweight titles against former WBA 135 lb champion Anthony Crolla (34-6-3, 13 KOs) on April 12 on ESPN at the Staples Center in Los Angeles, California.